Giving charity or Daan is very common in India. It goes back to ancient times, where Rishi/ Brahmin / Yogi who were the learned people of the society but prohibited themselves from directly dealing in money, trading or doing business. Even as they were the learned and educated people of the society, their sole survival was on charity or “daan”, which they collected from people for imparting knowledge. The concept of Daan or charity or offering is an integral part of Hinduism. It is different from begging. Begging is when you are doing it for survival because of your incapabilities. Here the Brahmin / Rishi / Yogi kept away from wealth which is a materialistic thing as it is considered to be the root cause of problems for spiritual awakening. Since childhood, every Hindu sees his parents or grandparents giving dan in his home. In this article, I have explained the concept of giving Daan as an astrology remedy and I have also listed items that you can donate as for each planet. What are the various Navagraha Daan items and how we can reduce the malefic energy of planets with charity? In your horoscope, the planets can be benefic or malefic. What that means is that the planetary energy is either good or bad for you. 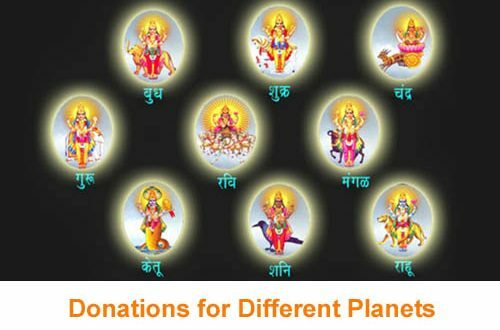 Donate Items of planets which are malefic and not benefic. If you donate items of benefic planets then you are doing the reverse of what is required for you. You are giving away your good energy, whereas the idea of doing “daan” is to remove your malefic or bad energy. Second most important is to know that when you are making a donation for any planet, it should be to people with whom you have practically no relationship. Means donation should always be to someone where there is no self interest involved. For example, donation should not be given to servants working at your house. It should also not be to drive who drives you or cleans your car. A daan or donation should only be someone totally unknown with whom you have no self-interest or expectations. The third most important thing before making a daan is that it should given with respect, humility and sincerity. It should never be a mere formality. If you do a mere formality, then you will not derive any benefits. Always get your horoscope checked to know which planets daan should be given. Daan should always be given of planets which are functional malefic and also debilitated in your horoscope. Well the answer to this is simple, as per your individual capacity. You need to understand that here the concept is not to bribe anyone. So what I mean to say is that by giving more you will not get more favours. Here the concept is of self sacrifice, humility towards others, surrender what you possess, yield before divine powers. Therefore if you can donate a cow that is good, but if you can donate only a glass of milk, it is still perfect.